A Christmas Carol is a classic Charles Dickens tale with a modern twist. In this adaption, stunning computer animation brings the well known story to life as Ebenezer Scrooge embarks on a lesson that will not be forgotten by himself or the viewers. The story unfolds on Christmas Eve in Victorian London. Scrooge, a miserly and embittered moneylender, who loathes Christmas, receives an unwelcome visit from the ghost of his former business partner, Jacob Marley. Shackled in chains constructed by the evil deeds done in his own life, Marley tells Scrooge that the same awaits him if he does not change his ways. Marley warns Scrooge that he is to be visited by three spirits over the course of the night and, just as Marley predicts, the first of the three spirits soon arrives. 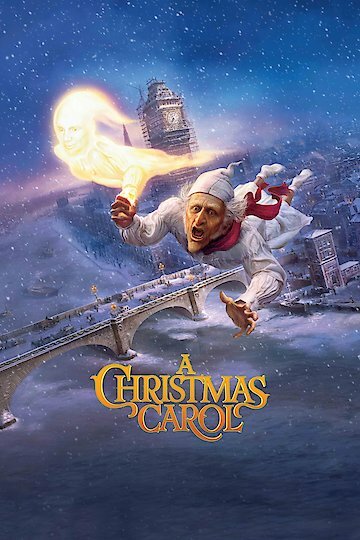 The viewers are swept along for the journey as the three spirits appear one at a time and seek to turn Scrooge from his greedy and hardhearted ways. The secret of Scrooge's hatred for Christmas emerges as the spirit transports him back through time to his youth, to reveal Scrooge's difficult childhood, and increasingly greedy young adulthood. As the unnerving night transpires, the Ghost of Christmas Present leads Scrooge on a journey to joyful Christmas day celebrations in the homes of his nephew, Fred, and longsuffering employee, Bob Cratchit. However, when the third spirit, the Ghost of Christmas Yet to Come, conveys him on a trip to the future, Scrooge sees scenes that both frighten and dismay. As Christmas day dawns, Scrooge ponders if the future must happen as he saw it, or if the terrifying future he witnessed can be altered by his behaviour and a complete change of heart. With sweeping views and realistic scenes of London streets, this visually stunning production offers comedy, drama, and a few life lessons, in addition to heart-warming cheer, in a truly unique adaption of the timeless holiday tale.